It would be hard to imagine Stanton Friedman writing a bad book, to be honest, so I picked up my review copy of 'Captured!' with enthusiasm. I was not to be disappointed. His collaboration with co-author Kathleen Marden has proven a great success, because she has counterbalanced his hard-nosed analytical prose with a very affectionate biography of her aunt and uncle, which fills in an awful lot of gaps about their personalities, and social standing in the community . In a tale as strange as this, context is vital for our proper appreciation of what may have transpired that fateful night in September 1961. The scientific and social elements of the story are both vitally important. Like many other readers of the UFO genre, I read 'The Interrupted Journey' by John Fuller some years ago. This excellent book was full of detail and analysis, and you might ask why it seemed necessary to publish a new book which, on the face of it, would cover much the same ground. Simply put, there was a lot more to this story than was initially reported. Facts were held back, confidentialities were respected, reputations were protected. Only as the years have passed has this information slowly surfaced into the public domain. The authors of 'Captured!' clearly intend for the full story to be recorded accurately in one book, both for posterity and to reinvigorate the 'alien abduction' debate. For example, there is a much more comprehensive coverage of the tapes from the various hypnosis sessions which took place with the psychiatrist Dr Simon. Whilst full transcriptions of the tapes do not appear in the book, analysis and documentary about them seems pretty thorough across several in-depth chapters. There is a lot of new material about physical evidence, and the later scientific analysis of that evidence. It is compelling, and suggests that the account given by Betty and Barney is demonstrably accurate. That forensic analysis would not have been possible four decades ago. 'Captured!' also takes us through the criticism and skepticism handed out by many high-profile commentators down the years. Stanton is at his literary best as he devotes a chapter to debunking the debunkers. It becomes clear to any rational reader that the story of Betty and Barney Hill, as sensational as it no doubt is, has been unfairly attacked by a lot of people who really should have got their facts straight first. This legacy of half-truths and debunkery by various armchair commentators was not something John Fuller could have anticipated in his early text on the subject. Stanton has, in turn, taken the sceptics to task. One of the things that strikes me is how so many high-profile people were involved in Ufology back in the 1960s. The book offers short biographies of the major players, many of whom were distinguished military personnel, or medical/scientific professionals. Back then the issue of the reality of UFOs was news; the media got involved and serious people sat on the boards of large UFO-related organisations. How very different it seems now, and reading this book really highlighted that social change. UFO groups seem to be small (or just on-line?) these days, and have no real public profile to speak of. The big-hitters in Ufology are the established writers from the 60s, 70s and perhaps the brief resurgance of Ufology during the X-files series in the 90s. Stanton is, of course, one of those people, and he writes authoritatively about a subject he is highly knowledgeable. If this same incident happened today, in 2007, how would it be handled now by the UFO researchers, the military, the science community, and the media? Very differently, I suspect. That cultural shift in the appreciation of the UFO subject, and its impact on our society, has changed a great deal. People with clout just aren't involved anymore. "The publicity surrounding the Hills' UFO encounter increased the scientific community's interest in the subject. In addition to the scientists who explore the UFO dilemma publicly, such as J. Allen Hynek, James MacDonald, Leo Sprinkle, David Saunders, and Carl Sagan, others were doing so quietly and secretly." Could we say the same about the scientific interest in this subject now? Not really. I find that cultural shift depressing, to be honest. I don't think it reflects well on our modern 21st Century society. As with all my book reviews, I like to mention my little bugbears, and things I would change. In the case of 'Captured' my biggest problem is with the photos printed on the pages of text. Occasionally, the reader's attention is drawn to aspects of those images, but the quality of the images in print is poor, and the detail attributed to the photo is lacking. It would have been better to have a selection of plates with decent quality photos. There were several typos too, the worst being a reference to 'pubic facilities throughout the United States', which appears straight after a paragraph discussing the sexual nature of the abduction experience (p196). Whoops. A bit of a Freudian slip there, I think! But entertaining nitpicking aside, this book is an excellent read. It's the kind of book which makes you realise why you got interested in UFOs in the first place. I hope it helps to bring a new generation of readers to the subject, and re-ignite interest in those of us who have been involved for years. After all, there is so much to learn about our place in the Cosmos, and the unearthly visitors who periodically show up uninvited. 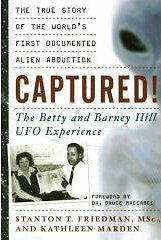 Subtitled "The Betty and Barney Hill UFO Experience"